The Centre for Education Futures has developed a range of resources to assist with the setup and management of assessment items within the LMS. Click on the checklist below for resources for each stage of assignment setup. If you are ready to start creating an assignment in the LMS we have resources available for each stage of assignment setup. This will assist you in the set up of a text based assessment item within Blackboard assignment, utilising SafeAssign for text matching. Before making your new assignment live to students, it’s always worth taking a moment to check your setup. While Turnitin Assignments can’t be tested using Student Preview, you can always contact the E-Learning Helpdesk if you have any concerns. The Assessment & Feedback Futures Team have developed a checklist featuring micro-videos, to assist staff who would like to mark Blackboard assignments online. The Assessment & Feedback Futures Team have developed an online marking checklist featuring micro-videos, to assist staff who would like to mark directly into a column in the Grade Centre. Providing feedback to students via a column in the full Grades Centre is useful for providing feedback on work that is not submitted to the LMS – or that is not text based assessment - for example a tutorial presentation, a demonstration, or a model or other artefact. Marking directly into the grade centre eliminates the need to double-handle the data or re-enter the marks at a later date, and provides accountability through a record of all changes to the grade, in case of student appeal. The Assessment & Feedback Futures Team have developed a checklist featuring micro-videos, to assist staff who would like to set up a rubrics in the LMS. 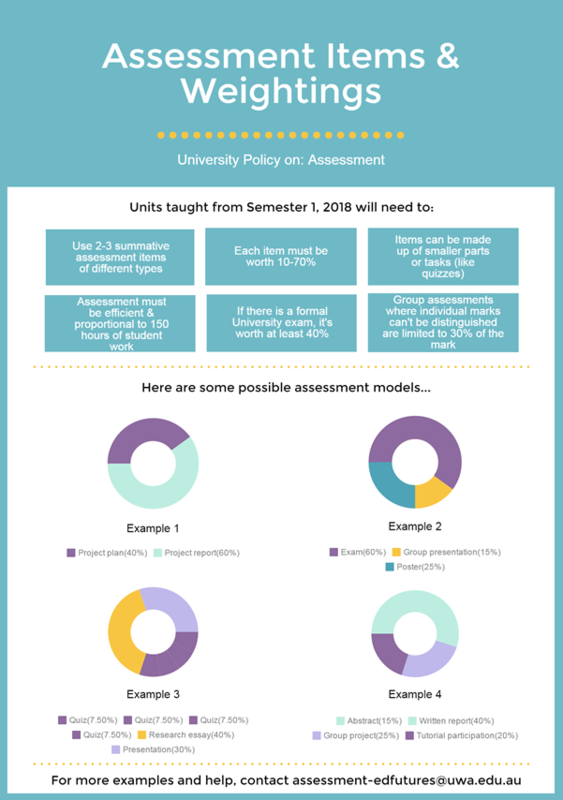 The University Policy on Assessment requires that either a rubric or marking key is used, and published to students, for each assessment item. Ideally, this rubric should be published to students both before the assessment is due and afterwards as part of their feedback (which must be provided on all assessed items). The Assessment & Feedback Futures team have developed a range of infographics and tools focused on Assessment and Feedback for staff. The Self-Assessment Questionnaire will enable you to check if your assessments will need to be adjusted for 2018. We encourage you to use it to assess where you require support. A 2017 Check-list can be found here. Help guides for the teaching and learning tools in Blackboard can also be explored in this interactive mind map (PDF) which links to the online help guides for each Blackboard tool. This guide can also help you decide which tools to use for engagement and assessment - You can examine each tool's strengths and weaknesses, and if you know what you want to achieve you can pick a column and follow it to see which tool is best for the job. Deliver timley high quality feedback. If you would like to redesign the assessment and feedback structure in your unit, please register for a Carpe Diem workshop. More information can be found on the Carpe Diem website . If you have already completed a Carpe Diem workshop, you can do an Assessment and Feedback Check-up workshop, to focus on ensuring your assessments meet the requirements for 2018. This session typically requires a minimum of three participants to run. Please check our upcoming dates, or contact the Centre for Education Futures to organise a session specifically for your work area. This session typically requires a minimum of eight participants to run. Please contact the Centre for Education Futures to organise a session time.